Mrs. McCullough was kind enough to lend this photo. 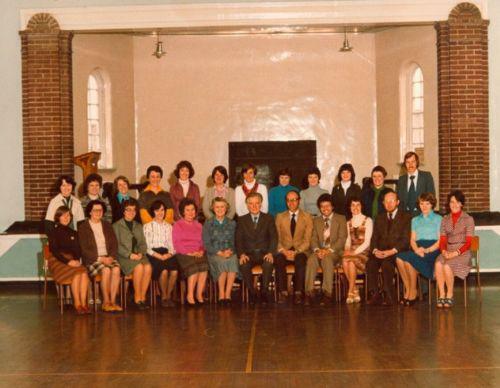 The range of years it might be from is narrowed as Ivan Jess became principal of Dundonald Primary c.1978-79. Mrs. Chambers is also in it helping put an earliest date. Front Row : Winnie Neill, Helen Sinfield, J. Holmes, M. Dickson, J.Downey, M.Andrews, Dr. J. Hunter, I. Jess, H. Simpson, M. McBride, W. Grant, N. Blevings, M.Thompson.